Each year in January when the incoming District Governors from all over the world are being trained in San Diego, CA the Safe Blood Africa annual Breakfast Meeting takes place at the Hyatt Grand Hotel at which time each of the incoming District Governors from all four districts in Nigeria have an opportunity to meet with the director and Safe Blood Africa team to discuss goals, fears, and challenges of the project up close and personal. These meetings have proved to be invaluable for personal comraderie and communication. 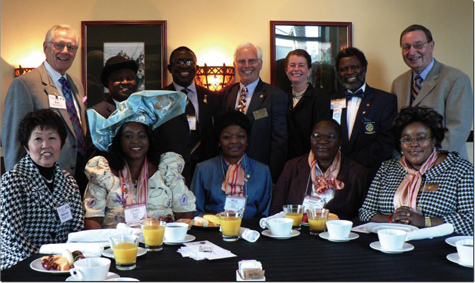 Clockwise: A breakfast meeting with the four incoming District Governors and their spouses in San Diego at the International Assembly (GETS); including l-r front row: Sharryle Eurich, , , , . L-R back row: DGE 5230 Bob Eurich, , , Warren Kaufman, Director of SBA Project D5230; Jamison Kaufman, Public Relations SBA Project; , DG August Hioco 5230.